Kerry visits Madge and Harold; she tells them that the new candidate is being backed by the same organisation as Harold is. Madge thinks this is because they have lost faith in Harold who is upset. Kerry asks if Harold is OK, he doesn't respond initially but then gets up angrily and asks Kerry who told her. Kerry says someone down at the Refuge told her, Harold doesn't believe Kerry, and he thinks it's just gossip. Madge sticks up for Dawn (who told Kerry). Harold says he is going to go and ask people first thing in the morning and storms off. Kerry leaves as Toby isn't well. Harold comes in and asks where Kerry has gone, he is angry with her. HAROLD: She's got no right coming over here and spreading rumours that she can't substantiate. MADGE: Oh Harold, you are going to have to face it, these high and mighty backers of yours are a bunch of shonkers. HAROLD: We will see, Madge. Beverly tells Joe that Noleen's death may have caused Toby to become a little run down, Joe thanks Beverly for coming as Kerry enters. Beverly tells Kerry that Toby has a touch of the flu but it's not serious. Kerry thinks Toby might have been faking it to get out of seeing the counsellor. Joe thinks it's a waste of time but Kerry believes it's too early to tell. JOE: If you ask me those head Doctors are a basket short of a picnic. Beverly tells Joe to give it time; Joe says he wants to get back to normal. Helen tells Jim she is going to see Derek Wilcox, Jim asks if there is any romance involved but Helen says they are just friends. 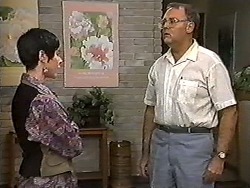 Jim tells Helen that he and Beverly are going to see a Marriage Guidance Counsellor, Jim is skeptical about this idea. Helen tells Jim that this might save his marriage and to be more open minded. Toby is off school as he is still ill. Naomi (Kerry's friend's daughter) and Toby make up but when Toby gets up Naomi steals his seat. The commotion attracts Joe and Kerry's attention; they children carry on arguing so Joe shouts at them. Joe leaves and Kerry makes them a drink, Toby and Naomi call a truce just as Lochie enters. She is going to school but will come back at lunchtime to see how Toby is, she is hostile towards Naomi. Ryan, Brenda and Sharon talk. Ryan says he has his aunt (Dorothy) wrapped around his little finger. 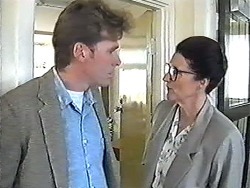 Brenda says he needs to talk to Dorothy about the supervised teacher in the common room, Sharon agrees with this. Dorothy comes up and Ryan calls her "Aunt", Dorothy tells him off for this. Ryan is embarrassed. Madge asks Harold why he disappeared early in the morning; Harold says he doesn't want to talk about it. They go into the kitchen, Madge apologises about the previous night, Harold tells Madge he's found out that it's true; some property developers who want to knock down houses to build a new shopping centre. They have already bought a number of houses; Madge says there will be a public outcry when everyone finds out. Harold says that the elected councillor will have the deciding vote on the project. Harold is upset that his backers have joined up with someone that has the opposite beliefs to him; he also says that they don't think Madge is a threat in the elections. MADGE: I'd tell them where to shove their shopping centre in no uncertain terms. Harold says he is going to pull out, him and Madge hug. Tony and Natasha are playing but when Joe comes in they pretend to sleep. Toby says he isn't well enough to go and see his counselor later. Joe tells Toby to rest, Joe goes into the kitchen. Toby explains why he is going to see a counsellor, Natasha's Mum also died. Toby asks her if she cried, she says she didn't but had been horrible to her Mum just before she died and she misses her sometimes. The counsellor is talking to Jim and Beverly, Jim asks if he is married, he says he was recently divorced, Jim is unimpressed. Madge is asking Joe how Toby is, Joe tells Harold it's a shame he's not running in the election anymore. Madge says she has decided to quit too, Harold tells her she shouldn't and he thinks she would make a great member of the Council. Beverly says she over compensated with work when her and Jim lost Rhys, Beverly says she slightly blames Jim. Jim says it's not fair, the counsellor tries to get Jim to elaborate but Jim isn't forthcoming and becomes aggressive. Eventually Jim tells him to ask Beverly instead. Madge, Joe and Kerry are discussing the election, Joe gives the kids some donuts and the adults go to the kitchen. Toby is messing with the doughnuts when Lochie comes in; Toby asks her if she would like to join him and Natasha. Lochie just squishes the doughnut into Toby's face! Sharon tells Ryan he was great earlier, Dorothy calls Ryan over and reprimands him for his behaviour in the library. Apparently Ryan stood on a desk and sang "I Can't Get No Satisfaction" (Rolling Stones). Dorothy says next time he misbehaves his senior privileges will be taken away as will his friend's. Sharon is not happy! 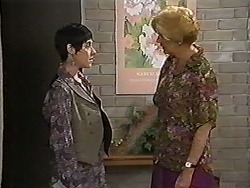 Jim and Beverly return from their counselling session, Helen asks how the session went, Beverly tells her to ask Jim and exits. 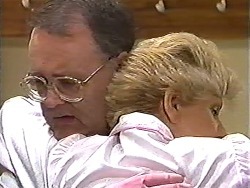 Jim tells Helen he hated it, Jim says he couldn't open up in front of a stranger; Jim says they are going back tomorrow. Helen says it's very important and he must learn to open up. Ryan is putting superglue on the chair, Dorothy tells a teacher that there is a phone call for him; she agrees to cover the class. Dorothy goes to sit on the chair with the glue on, Ryan looks nervous!